The Burtey Fen Collection is a privately-owned music hall housing three pipe organs – a Compton Cinema Organ, a Wurlitzer Cinema Organ and a Classical pipe organ. The collection also features a vast collection of memorabilia associated with entertainment. 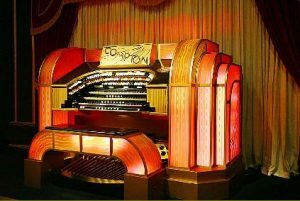 The Wurlitzer has rather a complex history and in fact is made up of two organs. The console is from The Regent, Ipswich, whilst the pipework is from The Gaumont, Exeter. Both organs had identical consoles and so the organ is generally referred to as being from The Gaumont, Exeter. Nicholas Pitts bought the organ in the 90s and, together with a small army of helpers, brought the console and its 600 pipes back to Pinchbeck – just in time as, two days later, the cinema was demolished. The concert organ is an amalgamation of parts of various organs, but its most notable paperwork is that from the Charterhouse School Chapel organ, built in 1872 by the German organ-builder Edmund Schultze. In 1927 it was offered for sale and eventually purchased by Henry Willis, who incorporated the famous ‘Schultze’ pipework into the organ of Holy Trinity Church, St. Marylebone, London.